Stairs are among of the most frequent places for falls, but with a little preparation, these accidents are mostly preventable. 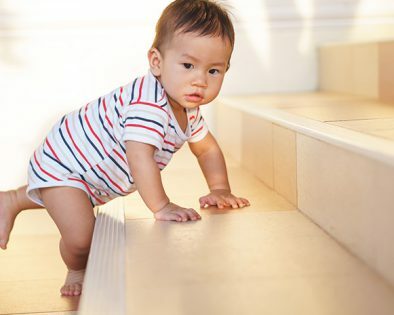 It’s easy to restrict young children’s access to staircases through the use of fences or baby gates at the top and bottom entrances, but you should never leave a small child unattended around stairs — even gated ones. Install staircase safety gates to prevent accidental falls for young children and pets. Do not use pressure-mounted gates on stairs, as they can slip under too much pressure. Use safety gates at the doors of the children’s rooms to keep them from the stairs. Attach a clear barrier such as plexiglass along banisters and railings. Avoid accordion gates, which can trap a child’s head. Secure heavy objects to your wall or remove them altogether. Every three weeks, a child dies from a TV Tip over. This should be a major area of concern around the house, especially if you live in an area at risk of earthquakes. Attach furniture such as cabinets to the studs in your walls with furniture straps. Utilize museum putty underneath all shelved items such as ornamental keepsakes to reduce the likelihood of those objects falling and breaking when bumped or shaken. If you have a flat screen TV, consider a wall mount instead of a basic stand.